Intel's Skylake-X platform promises to introduce the first ever 10-core SKU for the Mainstream/HEDT segment. It looks like another source has come forward, confirming the news story we originally published from Benchlife.info. This report stems from Digitimes and reaffirms the same thing as well as some additional details, lending credence to the fact that Intel has actually pushed its unveiling ahead of schedule. This is actually something that might make sense, given the fact that the company has cancelled the IDF event, which is clear evidence of a shakeup happening right now in the company’s traditional lineup. Interestingly, Digitimes also mentions that AMD is planning on releasing its 16-core Ryzen CPU and the X399 platform in the 3rd quarter of 2017 for the gaming market. If such a thing should happen, it would turn the tables on Intel, which will need to revamp its lineup in order to compete with the sheer number of cores that AMD will be throwing at it. According to the source, the 14nm Coffeelake processors and its Z370 chipset will be releasing in August as well as more CPUs and the H370 and B360/H310 chipsets following at the end of 2017 or early 2018. There is also a nugget of information for the industry enthusiast, Intel has apparently payed up $100 million to buy 5 EUV scanners from ASML, which indicates that it is accelerating work on Extreme UV lithography which is supposed to pave the way to 10nm and beyond (while staying on silicon). Benchlife claims the release of Intel’s brand new processors is going to happen by Computex this year – and they have a very good reason for doing so as we will soon see. The event is going to be held from May 31 to June 3, and it looks like Intel is planning on launching the brand new Basin Falls X299 platform at that time. 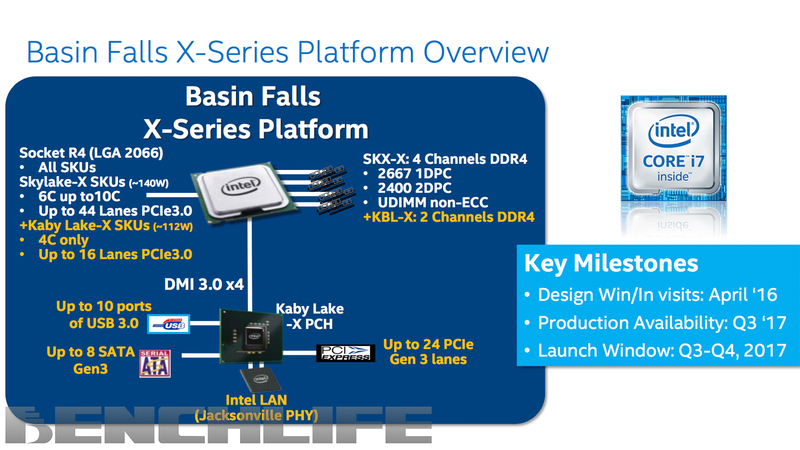 Overview of Intel’s X299 HEDT platform codenamed Basin Falls. The HEDT launch lineup will include at least four SKUs that will make their way to the X299 platform. All processors will utilize the 14nm process node, however, the Kaby Lake-X chips may have a slight edge due to the process optimizations. This would result in better clock speeds with reduced power consumption, adding to the efficiency. The four SKUs will include a 10 core, 8 core, 6 core and 4 core model. The 10, 8 and 6 core models will be based on Skylake architecture. The 4 core model will be based on the Kaby Lake architecture which launched on mainstream platforms earlier this month. All Skylake-X chips will feature a rated TDP of 140W while the Kaby Lake-X chip will feature a TDP of 112W. All chips will be marketed as the Core i7-7000 series processors and utilize the LGA 2066 socket. The LGA 2066 socket of the HEDT Basin Falls platform is called Socket R4. SKL-X will have up to 44 PCIe 3.0 lanes (a total of 68 lanes) while Kaby Lake-X will have only up to 16 PCIe 3.0 lanes (a total of 40 lanes). Skylake-X will have quad channel DDR 4 memory up to 2667MHz in 1DPC mode and up to 2400MHz in 2DPC mode. Kabylake-X on the other hand will only have dual channel DDR4. The Kaby Lake PCH will have 24 PCIe 3.0 lanes, 8 SATA Gen3, 10 USB 3.0 ports and connected via 4 DMI 3.0 lanes to the processor. Intel LAN (Jacksonville PHY) will also be present on the chipset. A rumor that stems from Bitsandchips.it, a publication that has proved to be fairly reliable in the past, suggests that the company might be taking the high road to tackling Ryzen. It has already promised to include 10 core Skylake variants in its high end lineup (Skylake-X) but if this report is true then it means we could be looking at a massive, 12 core/24 thread die as well. 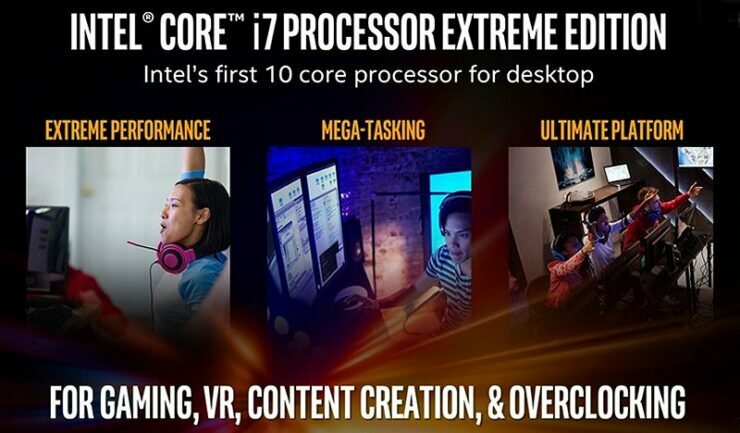 Assuming Intel is actually preparing a 12 core variant to include in the Skylake-X lineup then that means that you are actually looking at a lineup shakeup. Instead of the 6 and 8 core high end parts, we will be looking at 6, 8, 10 and 12 core parts. There is also one very obvious implication in all this, that Intel will be cutting prices across the board as well. Microcenter has already started cutting prices, but as of yet there is no word from Intel on an official price cut.